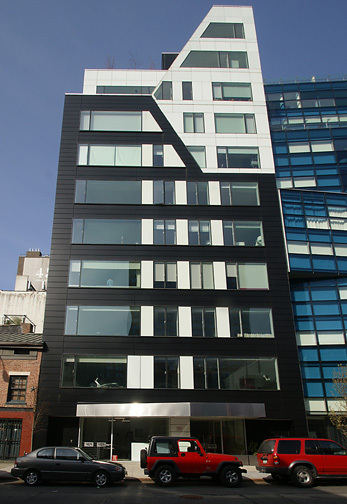 This 11-story, 10-unit residential condominium at 459 West 18th Street, which is known as the Onyx, is just to the west of Chelsea Modern, a larger residential condominium project at 447 West 18th Street and its architects, Della Valle + Bernheimer Design, specifically designed the building to complement the angularity of its neighbor, which was designed by Audrey Matlock. Chelsea Modern has an angled glass facaade and windows that open by extending outwards parallel to the building's facade. "Rather than look to the past as a reference, Della Valle + Bernheimer chose to respond to the design of an adjacent…building by architect Audrey Matlock…[that] is all delicate planes and irregular surfaces," said partner Jared Della Valle. "Ours is about mass, determined by the building's L-shaped plan and setbacks," he continued. "Severe in its mass, profile, and detail, 459 West 18th Street strives to achieve two different experiences. On one hand the project conveys a strong sense of place to would-be home owners in a neighborhood that is both new and constantly evolving and on the other hand possess[es] a sense of tranquility and quiet through its careful detail and muted interior palette," according to the architects. 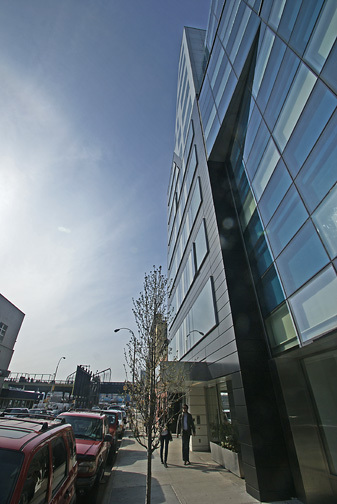 The building's façade is comprised of black composite aluminum panels and fritted glass and the architects note that "punctures through the mass for fenestration are expressed as extruded collars." The building, which has angled setbacks near the top, has a part-time doorman, central air-conditioning and heating, and keyed elevator. Most apartments have 9-foot-4-inch ceilings, recessing ceiling lights, and kitchen fixtures and cabinetry designed by Della Valle Bernheimer for RIFRA, Bosch dishwashers. The penthouse units will have 10-foot-5-inch ceilings and wood-burning fireplaces and Miele ovens and Ipe wood decking on the terraces. 459 W 18th St. LLC, of which Jared Della Valle is an officer and Robert Ricciardelli is a managing member is the developer. The design of this building is not radical and is highlighted mainly by its vertical angularity at its top while another Della Valle + Bernheimer project created about the same time at 245 Tenth Avenue is a more dramatic structure with a very slick and shiny facade. "The arresting black and white exterior geometry belies the serene, understated interiors within," according to this building's website. The building's upper slants are reinforced by some unusually large and dramatic trapezoidal windows. The building has a part-time doorman and its lobby has a cantilevered chrome reception desk, white corian bench, and white quartz stone floors. This building turned out more impressive in reality than in renderings for the black face is wonderfully rich black and from street level the top angularity conjures the pinching of the crown of a man's hat. In addition, it has a very handsome stainless steel canopy that is angled and the windows in the base are slightly protruded, a most elegant touch.